The 192nd AHC was one of our sister companies and was 10th Battalion's southern most outfit. The 192nd was based on the high ground that was to the immediate south of the city of Phan Thiet. Because the entire unit had come to Vietnam by ship they all had the same DEROS (go home) date. When this fact finally dawned on the powers that be, a scramble was made to swap personnel out with other units in order to scatter the dates so that they would not have all the personal leave at the same time. And I went from a 281st "Intruder" to a 192nd "Pole Cat". Three days later I was an AC again and rightly so. When I was signing into the 192nd, with another 281st pilot whose name I can not recall, 2 jets just happened to low level up the runway. Since we were signing in inside the OPS tent we could not see the jets, only hear them. Both of us yelled out "In Coming" and hit the floor with our hands over our heads. The laughter signaled the all clear and we got up and dusted off. Apparently the 192nd had never come under 122mm rocket fire. How fortunate for them. Being with the 192nd had it's immediate good points and it's bad points. The good points were that the unit was just as close nit as the 281st was and that, except for the deep jungle insertions which wasn't their mission, they were just as professional as the 281st. The bad points were that they lived in tents and had to eat Swiss Steak for supper 7 days a week. Just now, more than 30 years later, can I stomach Swiss Steak. In order to combat the Swiss Steak problem, an arrangement was made between all members of our tent called, "The Womb". Each pilot would have their folks or wife send, on a weekly basis, a survival package (5 lb. was the limit). We would pool our resources and cook our own supper. My folks supplied the Kraft Macaroni and Cheese and packets of dry soup. Smally's folks ran a cannery in the North West and they supplied us with various unlabeled dented cans of salmon & tuna. I believe Tweedy was the 3rd member of the tent and he had the Jiffy Pop popcorn and some other things. Chad Gilbert was the last member of the tent but I don't remember what he had to supply. So between the C-rations we could come up with and the packages from home and the swapping we did with the other tents, none of us lost any weight. There may have been a 5th man in the tent and his name may have been Gibson, its been a long time for the old memory. Each of the guys had their own distinct personalities. Smally was pretty quite while Gilbert was very outgoing. Gilbert's approach to things was the same as old "One Lung" and his light-hearted comments about the days fowl ups or whatever would bring a smile to almost any face. Tweedy was also a quiet one but his appearance demanded respect from even the RLOs for Tweedy sported one of the finest and largest handlebar mustaches I have ever seen. When he had to shave it off a month or two later nobody recognized him and he was treated as a FNG (new guy) for a few days until he figured out what was wrong and began telling people that he was Tweedy, just without the mustache. I thought he was a new guy too. The main mission of the 192nd was to support the ARVN and U.S. Troops in the area with combat assaults. They also did a lot of ash & trash runs. 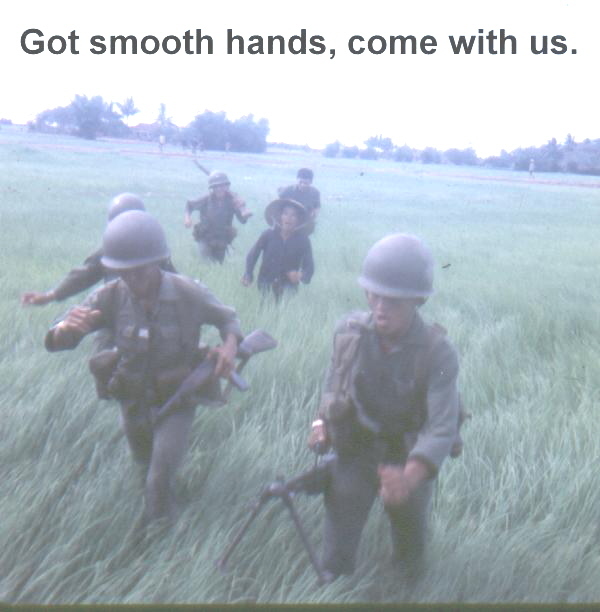 The 281st didn't do a whole lot with the ARVN troops but the 192nd sure did. They were not very good soldiers and more often than not, when loading up for an assault, I would see several of them hiding in the bushes so they would not have to go into battle. Countless times we pulled them out of supposedly hot skirmishes and some of them would still have the dust tape on the end of their rifle barrels. They were just not very effective soldiers. The 192nd had come over with all H-model Hueys I believe and they were all in pretty good shape. It sure was a pleasure to fly a ship with a good strong engine in it. Over to the side though were 2 real dog choppers that probably had the original L-1 engines in them instead of the L-11 engines. There was no such thing as an L-1 engine but it gives the other pilots reading this an idea just how weak those ships were. I think the radios were salvaged from Noah's Ark. Seats were comfortable though so they did have a good point. Flying those two ships was where I found my "niche" with the 192nd. They were much too under powered for combat and it was kind of like an insult or punishment to get assigned to fly them. Nobody wanted to fly either of them until I came along. With the 281st I had a lot of time in the older "D" model Hueys and was use to flying under powered ships so I didn't mind as much to fly them as the others did. Besides that, flying them meant I'd get to see more of the country and I'd much rather do that then be bored to death flying the ARVN all over the place. The OPS officer saw the perfect use for those ships and, what was once a real sore spot in the unit, became a blessing for all future ACs in the unit. I became the unofficial "Left Seat" transition officer for the 192nd. It became my job to take the unit's senior PPs and let them fly left seat on the many various ash & trash missions that we had. You couldn't get any better training than that for those new ACs to be. As I recall it only took about 1-2 weeks of flying those ships before they had a real appreciation of what the word "precision" meant. It sure got their heads outside the cockpit in a hurry and forced them to plan ahead for virtually everything that had anything to do with being an AC. As I said, I found my niche. The 192nd had a certain mission they did quite often. 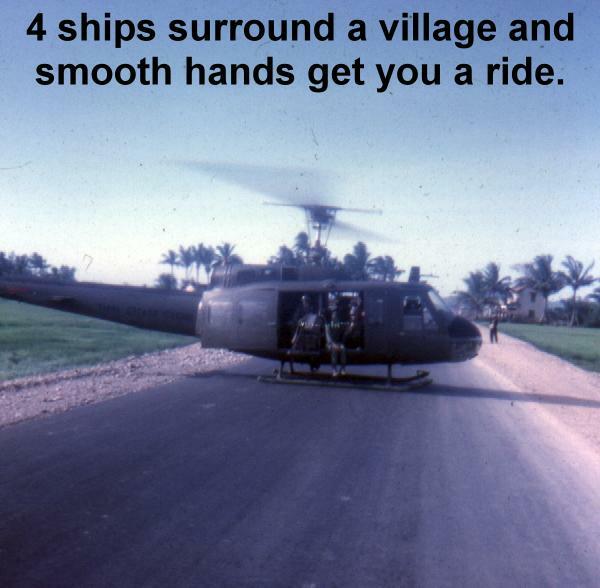 In the above picture and the one to your right, four ships would land surrounding a small community and their VN troops would go in and inspect hands. If your hands were smooth they took you away for interrogation. Rice farmers have weathered hands, the bad guys didn't. I only stayed 3 months with the 192nd before I DEROSed out. I made a lot of friends and felt good inside about having a hand in shaping the many pilots that I did. A lot of stories came out of my time there and the day I left I was given one of the highest honors possible. As I was boarding the "Freedom Chopper" for home, the young crew chief that had flown so many missions with me on his "dog" chopper ran up to me and yelled out "Sir". He then snapped to attention and gave me a "Stateside" salute, something you just didn't do over there. He said he would miss me. To me, that was the equivalent of my peers giving me "The Medal of Honor". That put a lump in my throat, just as the memory of it is doing now as I am typing this in. He had thought of himself as the bottom of the barrel crew chief wise because of the ship that he had. His attitude soon changed when he saw just how important that ship was to the training of all those ACs to be. It was still a dog as far as choppers went but by God it was the best kept dog chopper around. I am glad that I had a hand in shaping that young man's character.